Journey into Nyx will have five more Gods, in color pairs that haven’t gotten their indestructible legendary enchantment creature yet. Having seen what the first five multicolored gods can do, I feel this is a good time to take a guess on what their counterparts will do in the next set. The five Gods in Born of the Gods have the following abilities: UW draws cards, UB mills, RG grants size and haste to one creature, RB makes them sacrifice or take damage, and GW ramps. Those seem like abilities natural to that color pair, so I’m taking a guess based on what the other five pairs are traditionally good at. There is value to be gained in planning ahead here, because if we can anticipate what pairs well with those gods, we will be able to sell into the hype when those cards spike. 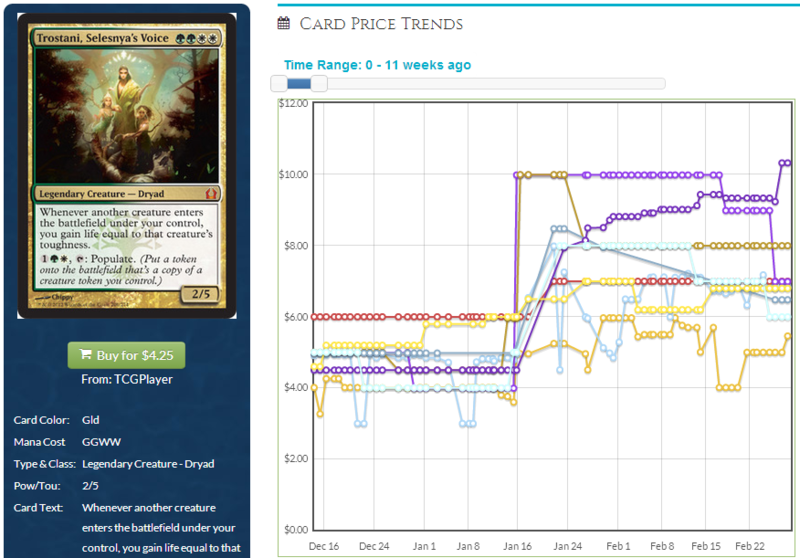 For example, see this graph for Trostani, paying attention to the spike right around when Karametra’s card was spoiled. Trostani’s price has only come down slightly since. These are not going to be long term targets. I am planning on selling or trading most of these right when the hype is at its highest. These are not the only cards that might spike, but I’m looking for ones I can pick up relatively cheap in trade, and then sell when their price goes up. 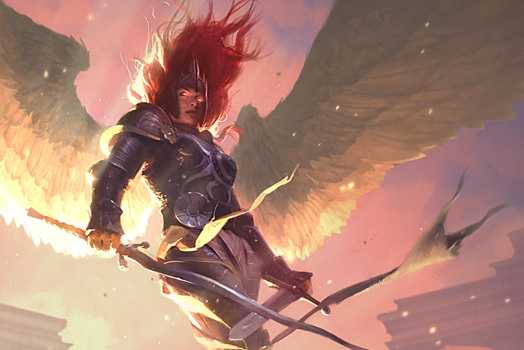 Aurelia plus the Boros god is a combo I can’t wait to play, and it doesn’t matter what the god’s static ability is. Aurelia does 80% of the work for devotion, and the only thing better than attacking with an indestructible creature is doing it twice in a row. Aurelia has that magic fourth toughness, meaning Bile Blight or Lightning Strike won’t cut it. I suspect that Iroas will cost four, but if it’s at five because of an awesome ability it creates a sweet five-into-six mana curve. My guess is that this God will grant a bonus to attacking creatures, à la Orcish Oriflamme. Iroas has been called the God of victory, though, so there may be some kind of bonus when you destroy somebody else’s creature, or something with fighting. Before Born of the Gods was spoiled, I was telling you to pick up Prophet at two dollars. It’s gone up nearly 50% since then. I’m still on board for picking it up around three dollars. I devoutly hope Kruphix will do something with +1/+1 counters, like double the counters on target creature at the beginning of combat. It’s more likely to do something tricky, like tap or untap a permanent at the beginning of each upkeep something along those lines. Prime Speaker is not the combo you wanted to be. Because its ability checks as it comes into play and the god’s devotion checks only after the permanent is in play, Zegana will not draw cards from the god’s power. That’s not going to stop people from wanting to try the cards together, though, and you should be ready to move a few of them when there is demand. This color combination likes spells, but we haven’t seen much to give us a frame of reference. Ideally, it would be cheap and give a bonus to spells. If it cost 1UR and made all instants and sorceries cost 1 less, that might be too good in Modern Storm. We haven’t had many copy effects; maybe this one will be three mana to copy any instant or sorcery. I would really like to see something amazing, like having it deal damage to a creature or player. I suspect that this card will be a bit more control-oriented, and in a slower deck Ral and Niv-Mizzet might be quite the thing. History tells us that spell-centric decks (outside of Delver) aren’t usually good enough in Standard, and so this is the speculation I’m least enthusiastic about. We don’t know much of what she will do. It’s likely that there will be interactions with the graveyard, my guess is that we will see something that brings back creatures from the graveyard to the hand. It’s a reasonable combination of these colors, and not an overpowered effect. Pharika might also do something that echoes being the god of gorgons, perhaps destroying anything that blocks one of your creatures. Lotleth is heavily dependent on which ability Pharika has, because pitching cards to the troll and bringing them back is an insane loop. It’s a very cheap pick up right now so you’re unlikely to lose. This card would be a lot better if Detention Sphere were not seeing heavy playing in most Azorius builds. With the addition of the G/B scryland and Pharika, people are going to want to build those decks and take advantage of Vraska, as well as Abrupt Decay, a card I like to go up a lot over time. Be prepared. A lot is going to depend on how much this god costs to cast. If it is four, then the Ghost Council is going to blow up. There’s already a combo with the Council and the Whip, and it seems like Athreos will fit right in. My prediction on this god’s ability is that it is a reprint of Sanguine Bond, only better in multiplayer. I think it will cost five though, and that will make it slightly more awkward to cast on a curve. An ability of “Whenever you gain life, each opponent loses that much life” would be very strong in casual and constructed alike. Another strong contender for Athreos’ ability would be Syphon Soul on upkeep, very straightforward and again, scaling well in casual play. I do not think that Blood Baron will go up significantly, regardless of Athreos’ ability or cost. It’s already fairly high-priced, mainly because of the set is in. There you have it, a set of three-month targets. I’m looking forward to seeing what these Gods do, and seeing how close I was to the finished product.